A custard tart layered with poached pears and toasted almonds. 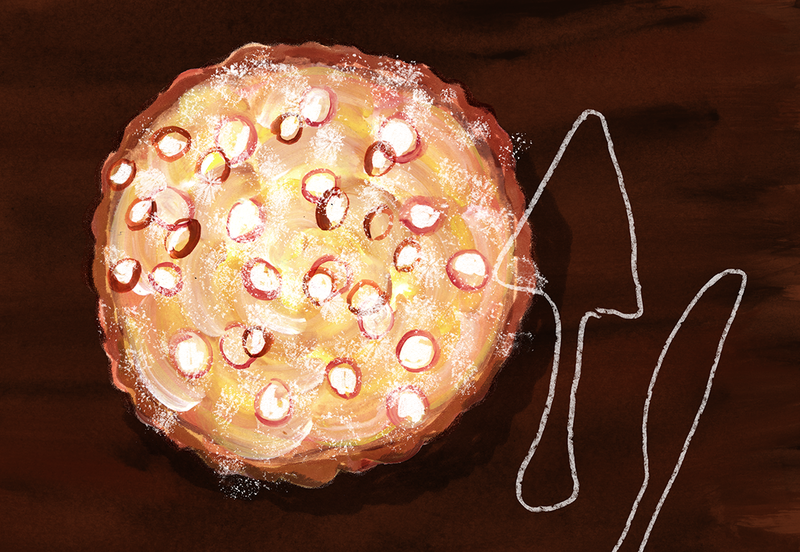 Influenced by Julia Child’s French custard apple tart. *I didn’t have a vanilla bean when I made this, so I replaced it with vanilla extract. It’s probably not as good as the real thing, but it worked! For the Pie Dough: In a food processor, stir together the flour, salt, and sugar. Sprinkle the cubed butter over the flour mixture. Pulse for a few seconds, or until the butter is slightly broken up into the flour. Sprinkle the water over the flour mixture, and process just until the mixture starts to come together. On a floured counter, press dough together into a flat disk. Wrap with plastic wrap and refrigerate for 30 minutes or up to 1 day. You can also freeze the dough for up to 1 month. 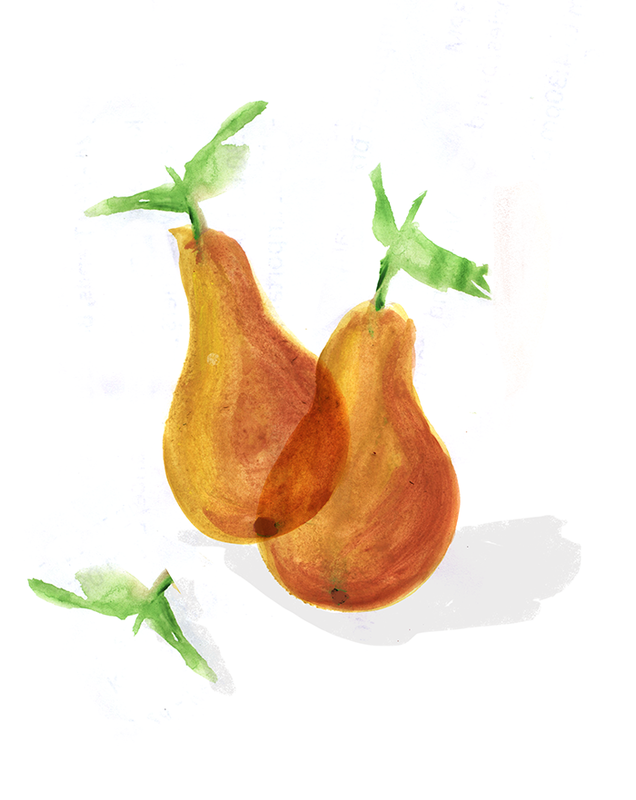 For the Poached Pears: Cut a circle of parchment paper that will fit in a medium saucepan. Make a small hole in the middle of the parchment. Boil 3 cups of water and ¾ cups sugar to boil in a medium saucepan over high heat. Reduce the heat to medium and add pears and orange peel. Split the vanilla bean and scrape out the seeds with the back of a paring knife. Add vanilla pod and seeds to the saucepan. Submerge the pears by laying the prepared parchment paper on top. Lower heat to a gentle simmer and poach the pears until just tender, about 15 minutes. Let cool in the liquid. Prepare Tart: Position a rack in the middle of the oven and preheat to 400°F. On a lightly floured work surface, roll out the dough into a circle about 13 inches in diameter. Transfer dough to a 10-inch tart pan or shallow pie plate. Trim away any excess dough. Line the tart shell with foil and fill with pie weights or dried beans. Bake until the crust is dried out and just starting to color a bit, about 20 minutes. Remove the foil and weights. Let cool. Cut each pear quarter lengthwise into 4 slices, then lay most of the pear slices in the crust in an overlapping circle close to the rim. Use the remaining slices to fill the middle. Make Custard: Beat together the egg and 1⁄4 cup sugar until thick and pale. Beat in the flour and then the cream, vanilla (or brandy), and salt. Pour custard evenly over the pears. Bake until the custard starts to puff up, about 10 minutes. 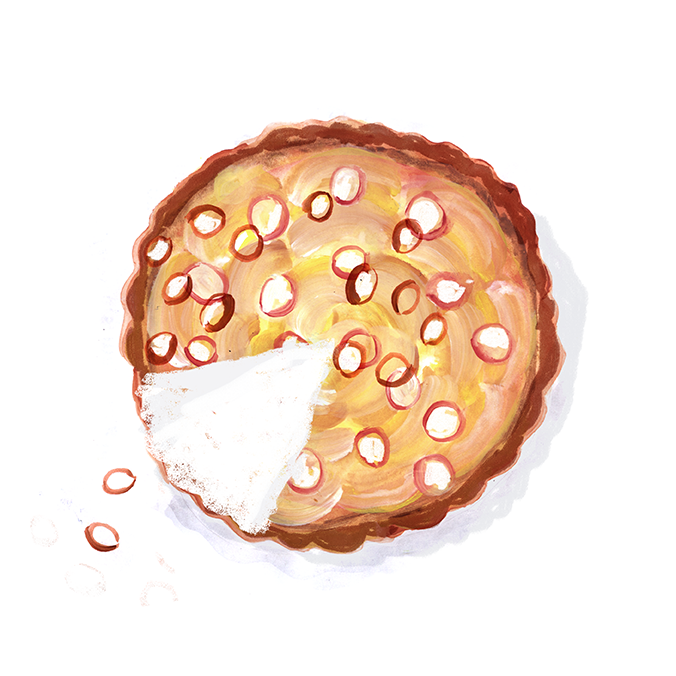 Sprinkle toasted almonds and remaining 1 tablespoon sugar over the top of the tart. Continue to bake until the custard is set and lightly browned, 15–20 minutes. Let cool on a wire rack until warm or room temperature before slicing and serving.